"It's beautiful!" 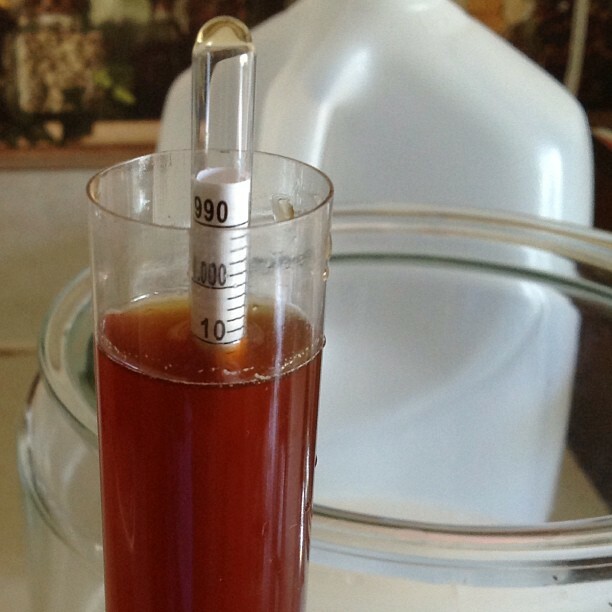 That's what I've said now on two occasions with regard to the new Belgian style Dubbel I'm brewing. A deep golden / amber color is what I was after. Yet, color predictions in beer become the "best guess" part of brewing to me. 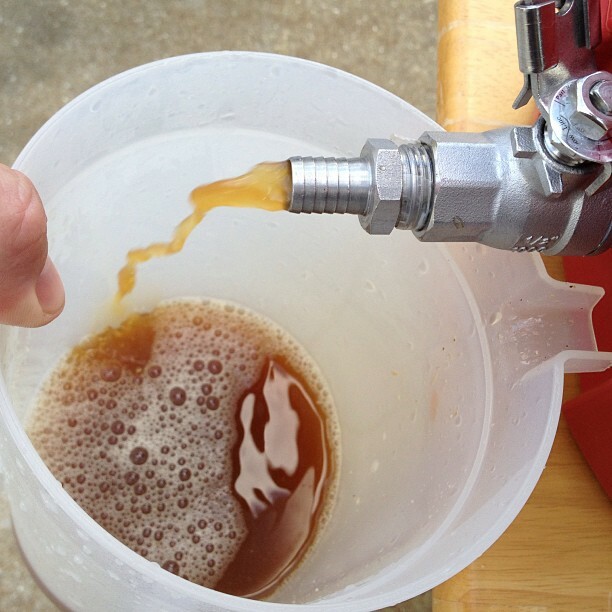 The photo to the left shows the wort initially coming out of the mash. Here I am capturing it in the pitcher to recirculate in the mash, as the grains in the tun act to filter the wort coming from it. Yes, indeed it is beautiful! But is it the color as it should be? Is it the color I intended? And, how will the color change as it goes through the boil and then fermentation? Three good questions, and while I have answers for each, some answers are better than others. 1. The color of a Belgian Dubbel: When brewing a style I will check the specifications in the BJCP Guidelines, which describe the attributes of the particular styles. When it comes to color, the Guidelines outline the range of colors deemed appropriate for the style. Style 18B... this is what is says regarding Appearance "Dark amber to copper in color, with an attractive reddish depth of color. Generally clear. Large, dense, and long-lasting creamy off-white head.". The SRM color range is from 10 - 17 for this style. SRM? 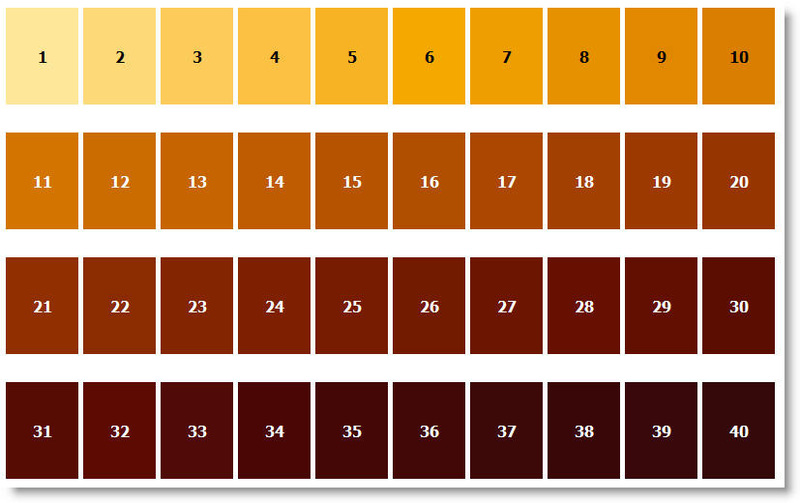 Stands for Standard Reference Method, and is one of the standards for judging color of beer. Here is an SRM chart I found online. It can be somewhat subjective, but it is good for getting within a range of colors. 2. Is it the color I intended? I suppose. I intended the color to fit in the range, and added the appropriate amount of darker colored grains to the recipe. I also had 1 pound of Belgian candy sugar syrup, which is supposedly a dark color, Lovibond of 90. Lovibond is another name for the colors, which equates fairly close to the SRM numbers. In a sense they can be interchangeable The true Lovibond colors were made with real samples of beer, placed in little tubes to make an actual true color chart. The lighting, and circumference of glass will all make a difference in the look of the color. So indeed, it can be quite tricky to examine color. each grain will have its color number associated with it, the the mixtures of these grains, with their associated color will help calculate the total color of the final beer. This calculation is the one I trust the least. Longer boil times will affect the color as well, giving the sugars more time to caramelize. Whew! Did I lose you? This brings me to the third question from above. 3. How will the color change through the process? In short, it will get darker. The boil will remove water through steam, which will leave the colors in a more dense state. Caramelizing of the sugars, as mentioned about, will make a difference toward the darker too. How does it look? Does it compare to where it should be on the chart? All I can say is that it looks beautiful.